We're dedicated to providing outstanding, professional taxi service throughout St Albans and beyond. We offer taxi service to London Colney, Park Street Lane, Colney Heath, Sandridge and Bricket wood. St Albans Drivr, makes travel simple. We're here to ensure that you always have access to our St Albans Taxi service, wherever you might be in St Albans or the surrounding area. Just tap and you're done. Easy. Simple. Fast. We believe that you should have booking solutions and professional transportation to fit your needs and the pace of modern life. Other services might require days of notice ahead of your travel plans, but not us. Our smartphone app gives you the means to book anywhere, anytime. Our professional, courteous drivers will await you at your appointed pick-up location and deliver you safely and on time to your requested destination. 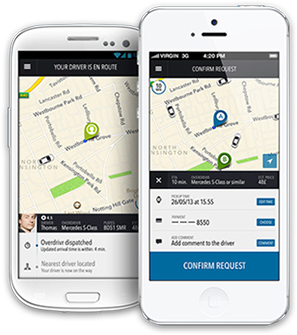 Smartphones have revolutionised the service industry and at St Albans Drivr, we're ahead of the curve. Our smartphone app embodies everything we believe in, from convenience to professionalism. It's simple, too. First, just tap on your desired pick-up location. Request a driver and we'll leap into action. Then, give us the address or the name of your destination and we'll deliver that information right to the driver. The app also shows you the route you'll travel, as well as your expected time of arrival. That's it - you're done. Tap, touch and finished. That's not all our app can do, though. Not sure how much your trip will cost in terms of fare? We'll quote you so you know exactly what you'll be paying before the driver even arrives. That quote is locked in - it won't go up unless you change your destination. You can also choose to split the fare, or share your time of arrival with others (easily letting family, friends or co-workers know when you'll be arriving). Used their taxi service when I was travelling to st albans cathedral. It was a nice journey.